I really like food that uses other food for seasoning. In this case I am talking about cheese used in place of salt to season the spinach. 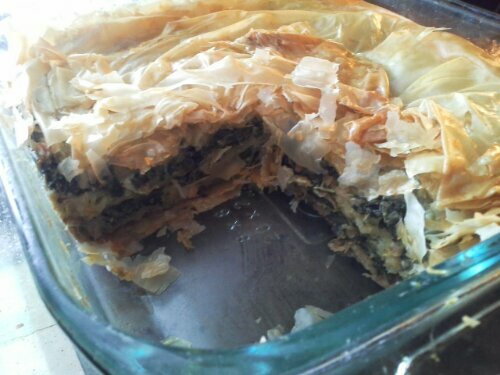 This is my version of a Greek Spanakopita. It is usually served as an appetizer or snack, but we like it as the main dish for a meal. My version is extra cheesy. Wilt spinach, in batches, in a large covered pot over medium high heat. The water clinging to the leaves is sufficient for this purpose. In fact, it is too much. Drain wilted spinach in a large colander, tossing every now and then so it will cool. Meanwhile, mix together the cheeses. Stir in the egg, green onion, and dill. Season with nutmeg and pepper. Melt the butter into the olive oil over low heat. Preheat the oven to 400 degrees F.
Brush a little of the mixture in the bottom of a square baking dish. Layer with 2 sheets of fillo, folding over because it will be too big. Sprinkle with butter/oil mixture and gently spread with a brush. Repeat in this manner with 1/3 of the fillo. Spread half the spinach mixture on top. Use the 2nd third of the fillo to make a layer as before. Top with remainder of the spinach and a top layer of fillo. Bake, uncovered, until the top is golden brown and the filling is bubbling, about an hour. This is my daughter’s favourite. I don’t make it often because of the butter content in the phyllo pastry. Your photo looks very tempting!